We made it. Another year. Another Father’s Day. How are you doing? I’ve now made it past the “baby slave” years and more. The kids just turned 9 and 11. I feel like we’re in the sweet spot—the kids are growing in ability, character, and independence, but not yet testing us much or so involved with friends that we never see them. We have conversations, play games, cook together, and laugh quite a bit. Yesterday, I was talking to my friend Chris has four kids, ages 1 to 11. At least four times, he said something like, “But who has the time?” That’s how I feel about thinking about being a dad—who has the time? 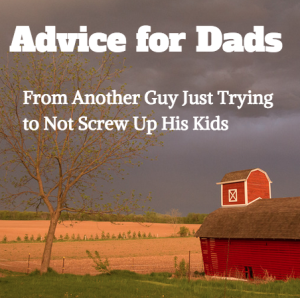 Dads everywhere are saying the same thing: “Who has the time?” What can we do about this? But today is the day. Generally, we’re going to be thanked. We’re going to hear, “I love you.” We’re going to get to eat what we want without criticism or concern. We’re going to be celebrated. Today is the perfect day to step back and think about how we’re doing and what we might want to change. Think of them like Father’s Day Resolutions. Here’s some of my thinking—maybe it will help some of you out, too. My two offspring have started to figure out lives for themselves and demand much less of my attention (i.e. they don’t poop their pants, dump glue on the carpet, or fall into the fireplace). So a lot of us start to coast. (Remember how tired we are?) But this is exactly when we need to focus on our kids more, to build a strong foundation of love and trust that will last until adulthood. Also, you should probably get life insurance. When I asked Ezekiel, our nine-year-old, what makes a good dad, he said, “Do things your kids want to do.” A few minutes later, his sister Phoebe answered the question the exact same way. Ouch. Dads, unite! One of the best way to be a good dad is to spend time with other good #dads. I wrote this blog post about it, and it’s had the highest traffic of just about anything I’ve written. Our kids have to see us respecting, building up, caring for, and yes, even kissing our wives. How else are they going to understand what real love is? That’s what I’ve got so far, and it’s only 8:00 AM. What other thoughts do you have? Leave a comment. And happy Father’s Day, guys. ← I Need a Date With a Good Man in the Next 72 Hours. (It’s for a Friend.) Please Share!